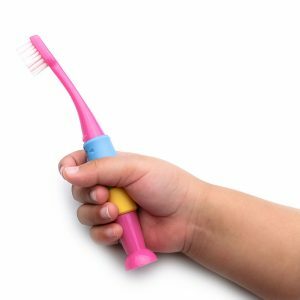 As one of the leading Pediatric Dentists Nashville has to offer we often get asked the question by parents, “when should I start brushing my child’s teeth?” In this blog post we answer that question and provide a simple 7-step guide to brushing your child’s teeth correctly from 18 months to 6 years of age. You can start cleaning your baby’s teeth as soon as the teeth erupt. Begin by using a clean, soft cloth to wipe the teeth and gums. If the baby can tolerate it, use a small, soft toothbrush and water. If the brush is a “no-go,” try introducing it again at about 12 months. But don’t use toothpaste until about the 18thmonth. Clean baby’s teeth and gums after breakfast and before bed. Move the brush in gentle circles to clean the outer sides of the teeth and gums. Make sure you hold the brush so that the bristles are angled towards the gum. Repeat the gentle, circular brushing on the inside of the teeth and gums. Brush back and forward on the chewing surfaces of the back teeth. When finished, encourage your child to spit out the toothpaste. Do not rinse with water because this may encourage the child to swallow the toothpaste. Replace the toothbrush when it shows signs of wear (about every 3 to 4 months). Frayed bristles do not clean the teeth and gums adequately. To safeguard your children’s dental health, call us to schedule a preventive care appointment. If you have questions about your child’s dental care, please click this link to see our FAQ page or contact us at 615-297-7597 to schedule an appointment.